Embrace the laid-back vibe of this tranquil Caribbean Island. 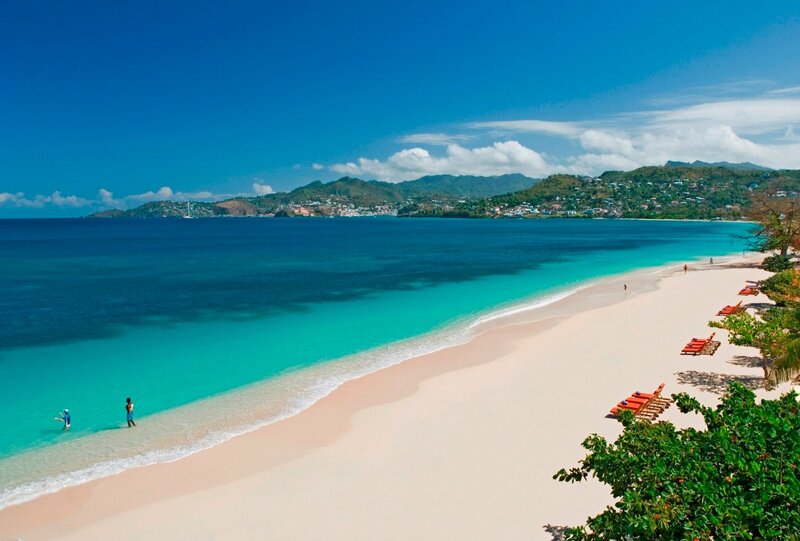 Grenada has the trademark white sands and turquoise waters we’ve come to love from the Caribbean. With no high-rise buildings and a natural untouched feeling, Grenada gives you the sense that you’re the only person in the world. Yet at the same time there is a vibrant culture, plentiful restaurants and fun nightspots. 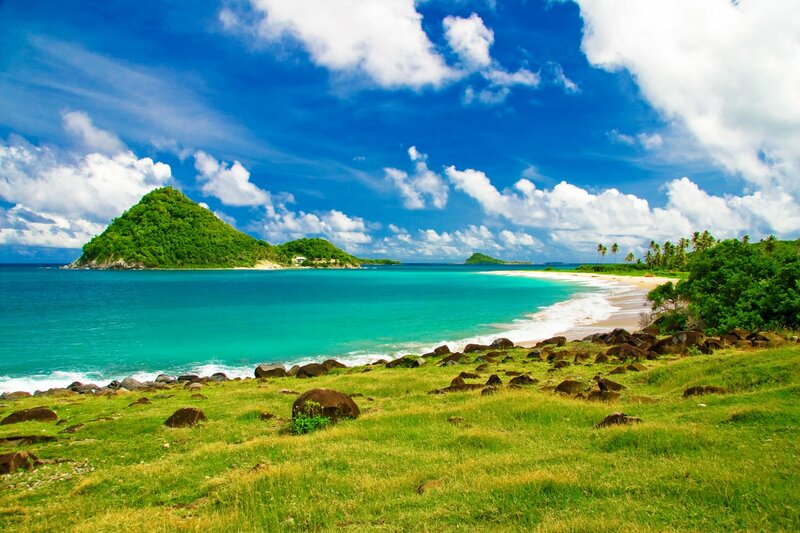 Located in the south east of the Caribbean within the Windward Islands (aka Lesser Antilles). Its warm tropical climate is perfect for a winter sun holiday. December to April see’s temperatures between 28°C – 30°C. The summer is warm and lively, however late summer and Autumn welcomes more tropical weather. This harbour town is easily explored on foot. St. George’s pastel coloured houses and quiet yet atmospheric streets makes for an unforgettable day out. Spend the day relaxing in cafés and restaurants and watch boats come and go from the famous Carenage. The colonial architecture, red roofs and quirky red phone boxes reflect its European legacy. View of St. George’s, Grenada. La Sagesse – A stunning and secluded cove with a nature reserve (once the estate of late Lord Brownlow, cousin to Queen Elizabeth II). Lavera (Bathway) – On the north of the Island Lavera has a wild retreat feel. Leatherback turtles have made their home here and hatchlings can be spotted in July. Anse – Swaying coconut palms, immaculate soft sand and clear calm waters make this beach a tourist favourite. Perfect for snorkelling you can spot a range of rainbow hued fish. There are plenty of restaurants and bars selling refreshing cocktails and views in every direction make Grand Anse a tempting haunt. Morne rouge – If you’re looking for seclusion this beach is tucked behind a hilltop. Quiet and tranquil this beach can be your own romantic slice of paradise. View of Grand Anse Beach. This forested and mountainous park is home to some beautiful wildlife such as hummingbirds, wild monkeys and a range of tropical flowers. You may spot a broad winged Hawklesser, a Grenada dove or an Antilles swift whilst hiking around towering mahogany and giant gommier trees. The park is an irresistible escape for those who love nature. Highlights: Seven sister’s waterfall and its refreshing natural pool (2$ entry). Grand Etang Lake (a water filled volcanic crater) and the luscious peaks Mount Qua Qua and Mount St Catherine. Info: Just a short drive from St. Georges. Hikes can range from 15 minutes to half a day and various types of terrain. For longer walks its best to explore with a guide (we or your hotel can arrange one). The visitor centre is open 8.30am – 4pm and entrance fee to the park is $2. Grenada is the producer of some of the world’s best organic, fair-trade chocolate. A chocoholics heaven, the Belmond Estate is an organic cocoa farm and plantation where you can see the process of how bean reaches bar and take a guided tour of the plantation itself. Heady chocolate aromas fill the air and chocolate tasting brings the senses to life. Try and buy the delicious chocolate in the restaurant and gift shop. Info: Tours are from $4 between 9am – 5pm. The plantation is located between St. Patrick and St. Andrew to the north of the island. each year in May the worlds best chocolate festival takes place in the True blue hotel. Cocoa beans at Belmond Estate. Thanks to its clear and warm waters, Grenada is host to a world of underwater wonders. Vibrant tropical fish, nurse sharks (harmless to humans), barracudas, turtles and more can all be spotted when snorkelling or diving. 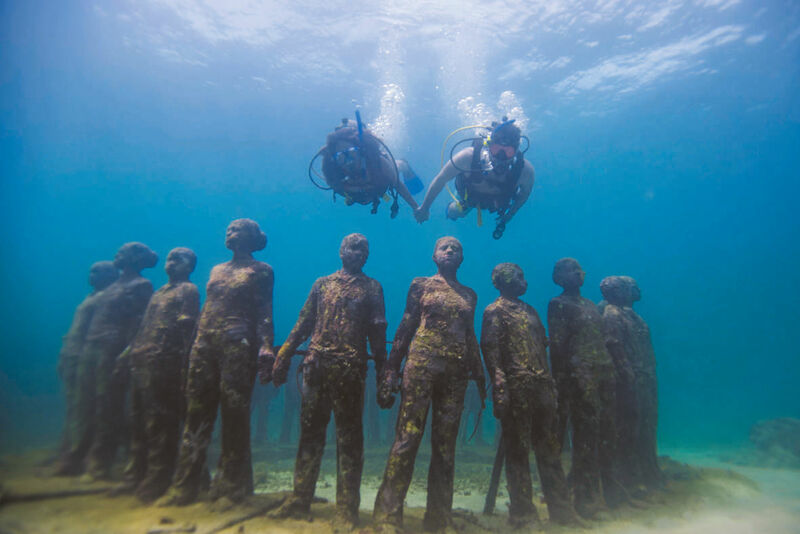 The underwater sculpture park has 105 sculptures and effigies which pattern the ocean floor, including life size human figures, the circle of children and still life objects. Diving in Grenada can also explore an underwater volcano, shipwrecks and wondrous coral reef. Info: The sculptures can be viewed by snorkelling, glass bottom kayak or scuba diving. Discovering a sea turtle whilst diving in Grenada. 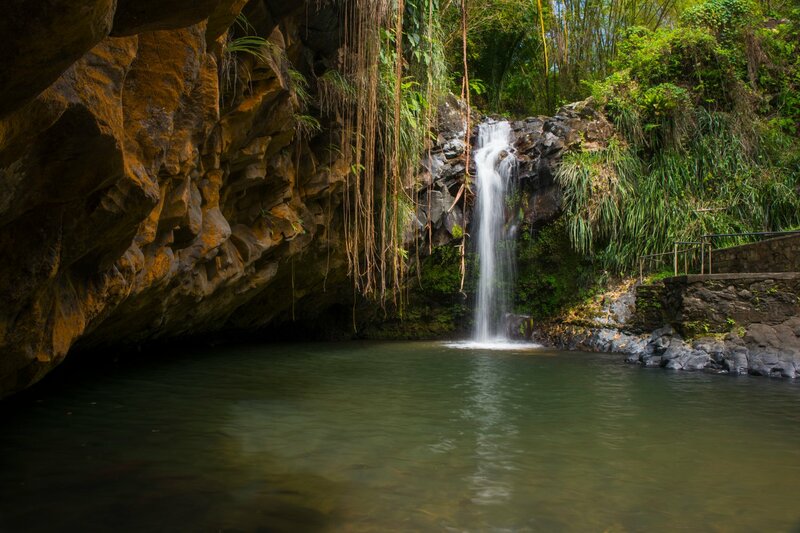 Waterfalls can be found across the island and the most beautiful of these is Annandale falls. Just a short trip from St. George’s, Annandale is easily accessible as you can drive right up to it. The falls are 10 metres high and meet a deep pool, which is perfect for a refreshing dip. Paths lead off to a botanical garden and lush vegetation surrounds the falls. $2 entry, open between 8am – 4pm. 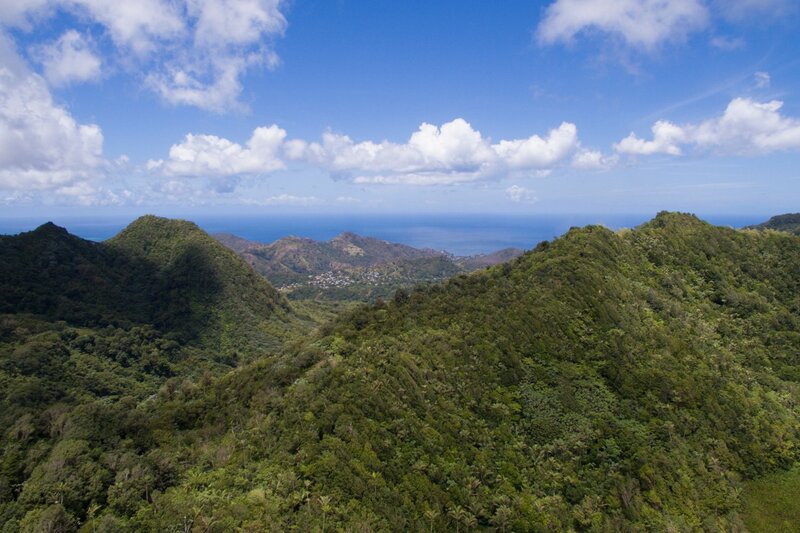 Located on the north tip of Grenada, Levera is a 450 acre stretch of protected coastal parkland. Wild mangroves and a picturesque beach line the shore and green cone shaped islands peak out of the sea. At the heart of the reserve a swampy flatland lagoon is excellent for spotting the local wildlife. Bird watching is particularly popular in this reserve and you’ll likely spot waterfowl, snipes, sandpipers, herons and more. Untouched and undeveloped this part of Grenada really takes you back to nature. What’s more, its completely free. Levera beach, Levera national park. Nutmeg, cinnamon, all spice, tamarind, cloves, mace, cocoa all grow in abundance here. Visiting Grenada the aroma of spice fills the air. There are plenty of plantations and a visit to Grenada is not complete without seeing one. 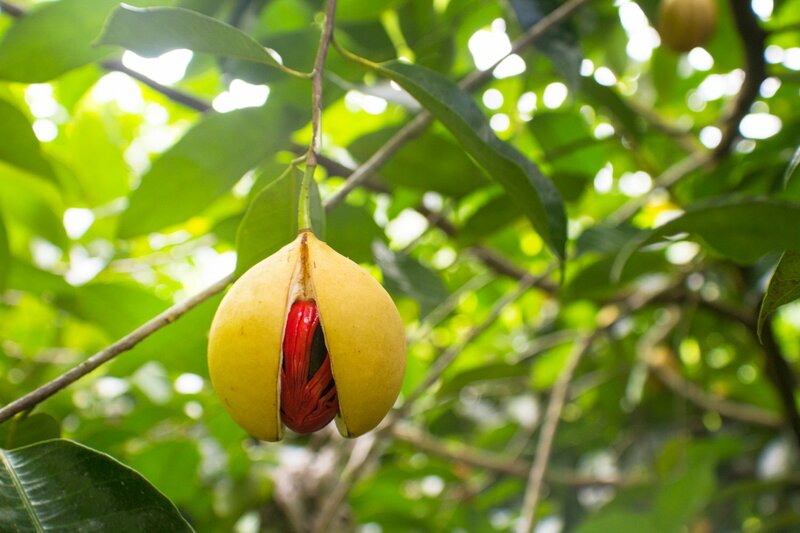 Dougladston Spice estate – A 600 acre nutmeg plantation. The factory is now non-working but you can see the old buildings and machinery used to process the spice. A historical monument of Grenada’s past. 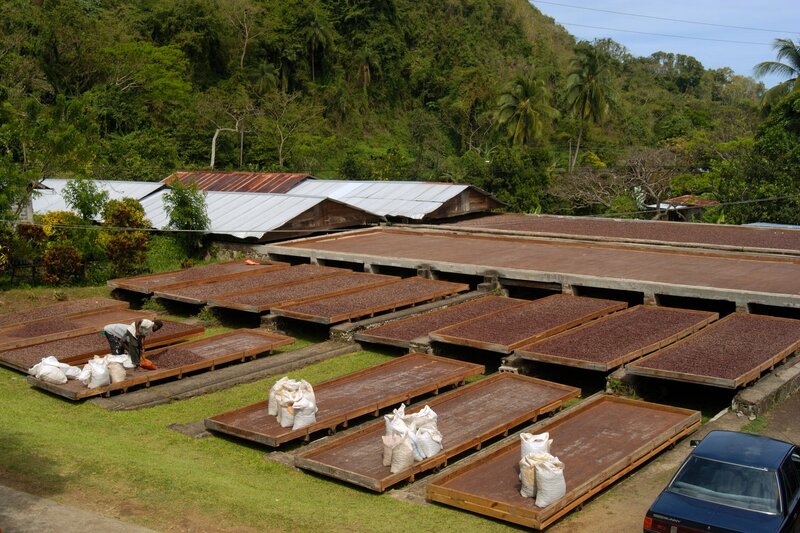 Gouyave Nutmeg Processing Station – A working factory, you can see the drying and sorting process. Tours start from $2 between 8am – 4pm. Not that you will ever tire of the main island of Grenada but if you want to explore a little more, Grenada is made up of 6 smaller islands including Carriacou and Petite Martinique. Carriacou is the tip of a dormant submerged volcano where geothermal activity feeds hot springs further inland the island. 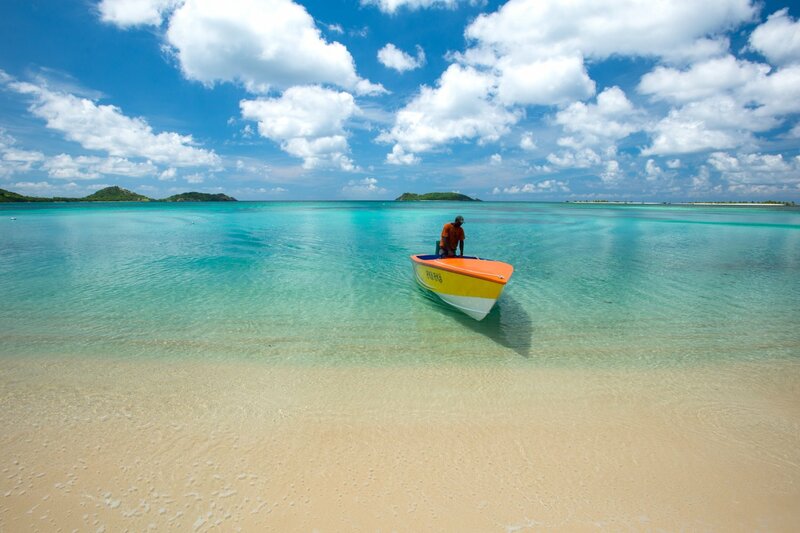 The first thing you’ll notice on approach to Carriacou is its lush green hills and perfect white sand. Info: Regular ferries depart St. George’s and takes about 2 hours to Carriacou but you can take day trips by sailboat, catamaran or the 8 minute sea plane. What on earth is Hashing you ask? A throwback to British forces in Malaysia where soldiers would walk or jog to wear off the ‘weekend’. Now every Saturday the Hash House Harriers meet and follow (walk or run) a trail of shredded paper and flowers. The social run usually starts and finishes at a rum shack (almost contradicting its purpose), but is an excellent way to meet others, cleanse and discover unknown parts of the island. They are known as ‘drinkers with a running problem’. 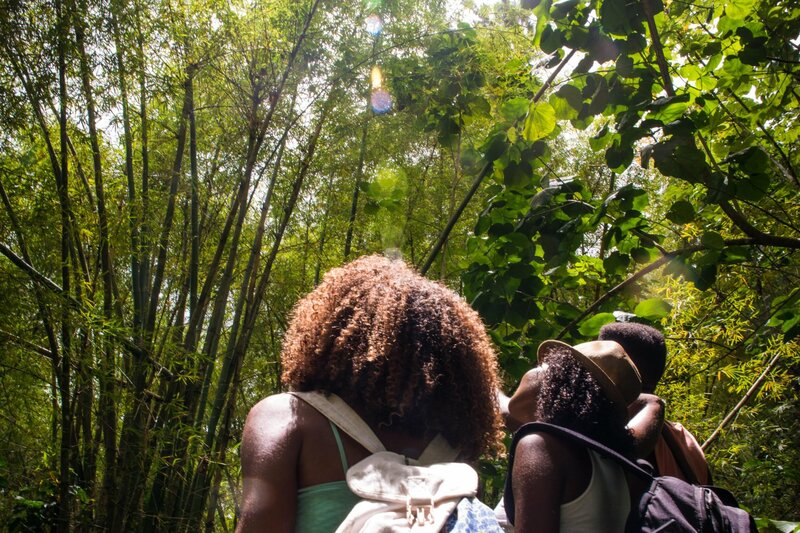 Forest trail in Grenada (Images courtesy of Grenada tourism authority). For where to stay in Grenada visit our website for a choice of luxury hotels. Have you been to Grenada? We’d love to hear your stories in the comments below. 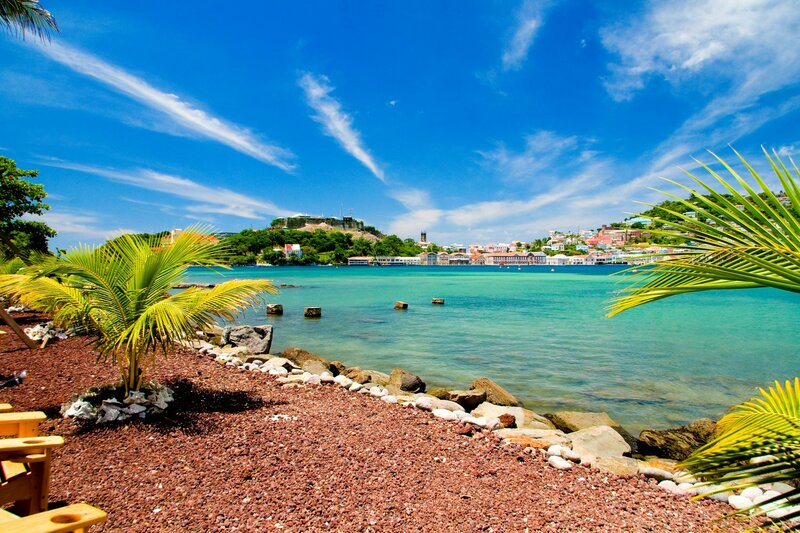 For more information on Grenada or other Caribbean islands, visit our website. For information on what to eat in the Caribbean read our blog post on Caribbean cuisine.